Mighty Fire Breaker™ Applied Fire Science and Technology Helping Builders Defend Wood-Framed and Mass-Timber Buildings From Fire Loss While Protecting The Carbon Naturally Stored In The Wood Of Such Buildings. It is well known that the building and housing industry accounts for more than one-quarter of all greenhouse gas emissions (GHGs) according to the Global Alliance for Buildings and Construction (GABC). By building according to green standards, as promoted by US Green Building Council's LEED v4 Rating System, we can reduce the impact that our buildings will have on contributing to climate change, while building resilience into our homes and communities. During a building fire, the carbon naturally stored in burning lumber is released back into the environment in the form of carbon dioxide, methane and other hydrocarbon gases. This contributes to our planet's greenhouse gas and global warming problem. To compound things, the greenhouse gases released during wildfires add to the total amount of greenhouses gases further contributing to global warming. In 2018 alone, the cumulative amount of greenhouse gases released by California wildfires is estimated to equal about 9 percent of the total greenhouse gases generated by human activity statewide during that year. According to a recent news report, California wildfires in 2018, released the rough equivalent of 68 million tons of heat-trapping carbon dioxide - about the same amount of carbon emmisions produced in a year to generate and power the state of California. During the past year, our largest national builders have embraced M-Fire Suppression's innovative Mighty Fire Breaker™ job-site fire-protection spray process – the building industry's newest best practice in fire protection during construction. This innovative process allows these builders to economically protect all lumber used during building construction, from the risks of fire. At the same time, M-Fire applied fire science and technology is protecting the carbon mass naturally stored in wood from being released during fire. M-Fire's Mighty Fire Breaker™ applied fire science and technology is not only being used to defend carbon stored in wood-framed and mass timber buildings, but also used to reduce the amount of radical toxic greenhouse smoke that is typically produced by fire on a building construction site. These builders are leading the way towards safer and better affordable housing, and teaching the world how to build in a greener and more sustainable manner, with consideration and respect for our environment, planet and future generation. They should be rewarded for their leadership. In view of the positive impact that building with lumber can have on the global climate change initiative, we should encourage and demand leadership to take action on several important fronts. For example, the US Building Industries newest priority should be encouraging and rewarding every builder who defends sequestered carbon stored in the lumber within their buildings using, for example, innovative applied fire science and technologies such as M-Fire Suppression's Mighty Fire Breaker™ job-site fire-protection. The LEED Rating System of the US Green Building Council should also recognize the high-performance credit value that defending carbon storage in wood-framed and mass timber buildings brings to our housing industry and planet. Our US Government should also reward builders build affordable housing and other wood-framed and mass-timber buildings, for using fire-protected lumber naturally storing and banking carbon mass from being released into our environment to generate increased levels of carbon dioxide gases. This reward could come in the form of a modified Q45 or like tax credit from US Congress. With such credits and incentives, builders of high-density fire-defended wood-framed and mass timber buildings will be in a better position to support our housing shortage, and create fire-defended carbon banks that produce as much value as wind farms and solar fields. By doing so, we will take new constructive, bold steps towards creating a cleaner, greener and more sustainable economy and planet. 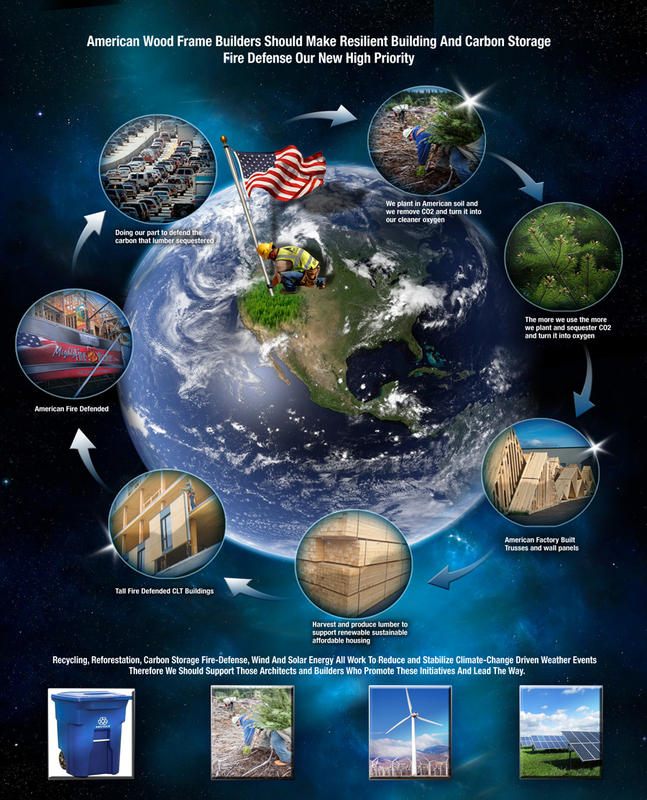 Defending carbon stored in the lumber that supports our housing starts and economy must become as high a priority today as our recycling programs, wind and solar farms, because we can no longer support the weather related losses caused by climate change driven events occuring world over.